A DIY barrel stove kit can transform a useless old barrel into the focal point of your get-togethers, camping trips and weekends spent under the night's sky. Barrel stoves are a fantastic way to keep warm on camping trips, fend off the cold at the cabin getaway or warn away the winter chill inside workshops. They are also an excellent choice for the back garden to keep the party going after the sun has gone down. But, using a barrel stove is useful for other reasons too. It benefits the planet by burning renewable sources and doesn’t burn a hole in your pocket like more-modern heating solutions. Even some scientists think getting a barrel stove is a good idea. 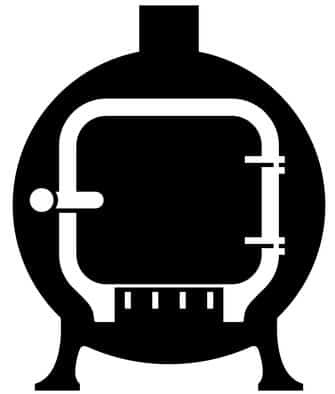 Okay, they may not have said it directly, but getting a barrel stove usually gets groups positioned in a circle. By sitting in this way and facing each other, researchers have found it builds relationships and creates meaningful discussions – and all this time we thought it was peering at those stars that was the reason campfire chatter is always so interesting. With a quality barrel stove, your camping group can be socializing like the Knights of the Round Table and enjoying some barbeque classics. But, one of the best things about these dawn-to-dusk natural heaters is that they can be handmade. Well, sort of. To turn a barrel into a stove you need to get your hands on a barrel heater kit. Making one yourself can give you a temporary hobby, help get the creative juices flowing and give you something to make to be proud of. These kits include all the parts you need to change a barrel drum into a stove, such as legs, dampers and a door to load the wood. To help your DIY-heater project go smoothly, we have sourced two incredible barrel kits for you to take a look at. We've also included the perfect barrel for you to use in combination with these awesome DIY wood stove kits. We did the research so it gives you more time to chop wood, and of course, persuade your partner that this is going to be an amazing idea. Keep scrolling to find out all about them. Take a look at how the top barrel wood stove kits compare in the table below. These are the only two barrel wood stove kits on the market right now that are worth considering. They're made by two of the top stove manufacturers in the business and they're both quality operators. It should be note that besides a noteworthy kit you'll also need to source a decent barrel as these aren't included. But, don't stress as following these two kit reviews we also recommend a barrel that is perfect for this application. The first barrel kit we want to introduce you to is this one from the US Stove Company. These guys have been knocking up quality fire and heating-related products for some time and have proven themselves as reliable manufacturers. This kit has been made to be used on steel drums with capacities between 36 and 55 gallons. However, some past customers have claimed that they made their kit work on smaller barrels as small as 30 gallons. Just be meticulous if you plan on using it on a smaller barrel and be prepared to pay the price if it doesn’t work. We also have to say that this kit is not for sale in the states of Washington, Oregon or California. This is because the product doesn’t fit with local regulations and laws. The kit includes a heat-resistant door. This will need to be added to the barrel with a bit of know-how and good craftsmanship. If this doesn’t sound like you then grab your smartphone and start scrolling through your phonebook for a friend that could be perfect for the job. Just remember to invite them to your first camping trip with the barrel stove. It has legs to keep the fire at a safe distance from the ground and to make sure it remains secured and sturdy. This is as well as a collar, damper and it is expectedly supplied with all the required mounting hardware. Yes, you do actually get the right size and right amount of screws and bolts when buying this barrel stove kit. To give customers extra piece of mind, the kit comes complete with a one-year warranty. Compared with what is to come, this barrel wood stove kit is very similar but it does win a few battles. One of the positives from this one compared to the Vogelzang model (coming next) is the inclusion of a one-year warranty. When it comes to value for money, this product is more expensive than the following Vogelzang model. There's not much between them in terms of performance but there is a few bucks separating them. I guess it depends how much you value that one-year warranty and US based craftsmanship, but for us this is the winner. The Final Verdict: This is a quality product and in our opinion the best barrel stove kit around. Just keep in mind the size of barrels that this one is designed to cater to. Recommended Next: Just how efficient are pellet stoves? Find out in our big guide. Another great option for barrel-stove-kit shoppers is this Vogelzang product. This kit has all the bits and pieces needed to make a barrel stove. The barrel it’s used on needs to have a capacity between 30 and 55 gallons. With this kit, you'll soon move on from a useless barrel to an intriguing and cool wood burning barrel for camping trips, or to just enjoy the outdoors with at home. All of the parts you get when buying this kit are made completely from solid cast iron. This allows your future barrel stove to last even longer and withstand those extremely hot temperatures. These parts can be fitted to the barrel by anyone with a little DIY knowledge and access to a couple of necessary tools. Or, someone with access to another person with these skills and tools. Thank you payments usually include beer, pizza or an invite to your next barbeque. More details about the kit’s door are that it has been designed to read “Barrel Stove” on the front and that it measures in at 10 inches by 11 inches. These measurements will help you work out the exact placement of the door on your barrel. In total, the kit includes the reliable door we just mentioned along with legs to keep it stable and safe and a damper. For those who are unaware, a damper is a plate or a type of valve that regulates or prevents the airflow inside of the barrel – or other similar fire-giving products. This DIY wood stove kit is a great choice for anyone looking to make a camping trip even better and give the kids the chance to toast some marshmallows. It outshines the model we just took a look at in a couple of areas. Even though the two kits include the same items, this one has been designed to be used on a broader range of barrel sizes. We know the previous one had been claimed to be okay on smaller barrels but this one has been specifically approved to be used on drums as small as those holding just 30 gallons. The only other thing that separates them is the price. For less than half the price of the one we just saw you can get almost the same wood stove kit right here. The Final Verdict: Choose this barrel heater kit if you want quality but don’t want to clear the cobwebs from your wallet too much. Also, choose this one if you want to create a barrel heater on a smaller-sized barrel. Recommended Reading: Don't have time for DIY? Check out our guide to small wood burning stoves. The kits that we just covered are both awesome but they don't come with one essential ingredient... the barrel! Fear not as the following drum is absolutely perfect for creating a barrel stove. Now that you've got your stove kit, you will need a barrel to enhance and manipulate into an awesome heater for camping, exploring or just hosting friends and family. 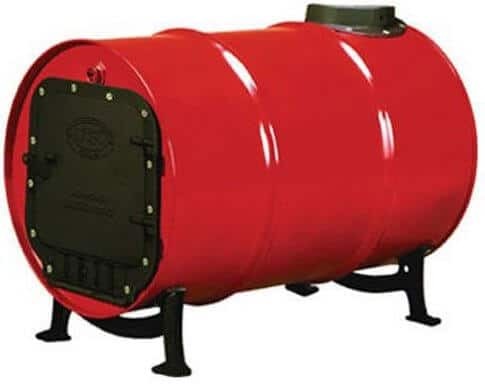 Both of the kits above can be classed as 55-gallon drum wood stove kits so there couldn’t be a better barrel to feature here than the 55-gallon Vogelzang drum. This DIY wood stove barrel kit has a closed head which means you cannot remove the top lid without firing up the power tools. This is good news for those wanting to create a barrel stove because it means it’s an all-around air-tight and solid construction. Despite what you see in the pictures, this barrel will usually arrive unpainted, but some customers have claimed to receive various colors. This barrel may look like it’s made by the same brand as the second stove kit that was featured above, and that may make you think it’s best paired with that kit. However, the US Stove Company are actually the owners of Vogelzang branding so any of the products here have been made to complement each other well. The barrel is made of a heavy-duty steel that you can rely on and has some impressive thickness measurements to make it last even longer. If you’re looking for a barrel to go with your kit, this may be your best option to create an excellent 55 gallon drum wood stove. Recommended Article: Make your stove as energy efficient as possible with a heat powered fan. Before you leave us to start designing your future barrel wood stove. We wanted to give you a few more top tips to keep in mind when searching for a barrel stove kit perfect for your needs. Consider the kit AND the barrel – it’s easy to get taken away with statistics about the durability, parts and features of barrel stove kits. But, it could be the best kit in the world and still be the worst choice for you. Making sure the kit fits the type and size of barrel you intend to use is key. If you don’t have either yet, then make sure you buy two products that complement each other. We did that here by showing you a barrel with a 55-gallon capacity and two kits that are applicable to such a size. If you forget about pairing them to match you could make a fundamental mistake that will cost. Again, consider the barrel – you also need to consider the barrel for another reason. How you intend to use the barrel stove when it's finished will play a big part in the size of the barrel you go for - and therefore the type of barrel kit you buy. If it’s going to stay in your garden or in a workshop you will have more freedom. But if you are going to add it to a vehicle on camping trips, you will have to weigh up the dimensions of the barrel with your doors and consider its weight. Have the tools ready – it can be exciting to receive your kit and you may want to get the fire roaring that evening. For this to happen, you will need to do your research, make a plan and make sure you have the correct tools to make it happen. Power tools will be your best friend, but a hacksaw and a drill could still be useful. If this isn't your area of expertise, you could always pay a friend who knows a thing or to about these sorts of projects or get online and find the best advice. Recommended Article: Ever wondered how to clean barrel stoves? With one of these awesome ash vacuums. So, that is that! These are two of the best DIY wood stove kits on the market and are great options for first-timers or seasoned professionals.They’re made by experts and manufactured with materials to last many evenings in the brisk cold air for years. Thanks for joining us on today’s guide looking at barrel wood burning stove kits. Pop back and join us again for more interesting discussions on products we know you want to own! Don't forget to follow us on Facebook and Pinterest to see more guides like this on a regular basis!